Brewing tea, brewing coffee, or infusing a liquid with flavor — all done every day, all over the world. But not like this. The Bkon Craft Brewer is aiming to revolutionize the brewing process with a technology it calls RAIN — Reverse Atmospheric INfusion. Basically, it does its magic in a vacuum chamber, using negative pressure (and lower temperatures) to coax every bit of flavor out of your tea, herbs, fruit, or whatever else you put in there and blend it perfectly with the liquid of your choosing. Oh, and it takes only a minute for tea, and a couple for vodka. And it sports a touchscreen that's pre-loaded with hundreds of recipes and hooked to the cloud for sharing/downloading more, meaning all you need is some tea, some water, and a finger to tap the screen. One trip to a high-end steakhouse is all you need to convince yourself of the benefits of dry aging — and one look at a professional setup will convince you it's not worth the price. Luckily, there's the Steaklocker. Billed as the world's first at-home dry-aging fridge, it uses fan forced air technology and a host of sensors to keep your meat within safe temperatures and alert you (via app, of course) if they veer off course. It also looks great thanks to a stainless steel and glass build that will look right at home in any gourmet kitchen. Inspired by the classic enamel camp cups of old, the Mazama Camp Cup is an easy way to add a touch of nostalgia to your next camping adventure. Available in 12 oz. and 8 oz. versions, these cups were designed to offer a grip that's both solid and comfortable, with tapered, unglazed feet that allow for nesting. Finally, a special glaze technique that uses two glaze colors creates that classic look, making your morning cup of joe that much more enjoyable. Almost as soon as the iPad was announced, it became a kitchen staple for tons of cooks around the world — but unfortunately, none of the recipes it could offer up were able to communicate with anything else in your kitchen. The Drop Smart Scale is about to change that. It's the first in a series of smart kitchen products that connect with an app to ensure you're using the right amount of each ingredient, while automatically moving on to the next step so you don't get gunk all over your screen, and letting you easily increase or reduce quantities by doing all the math for you. Just open the app, turn on the scale, place a bowl on top, and go. Say goodbye to your deep fryer and hello to healthier food with the Philips AirFryer. As the name suggests, this nifty appliance can fry foods with little to no oil thanks to its ability to circulate hot air at temperatures up to 390 degrees. The result is extra-crispy food that's cooked thoroughly, using a tablespoon or less of oil — which of course means far less fat. Not in the mood for fried fare? Using the touchscreen, you can also set it to bake, roast, or grill, meaning that unlike your deep fryer, it might actually be worth leaving out on the counter. Most modern espresso machines are rather complex affairs, with built-in frothers, pumps, and sometimes even grinders, letting you brew a cup with the press of a button. The Strietman ES3 Espresso Machine is not most espresso machines. Handmade in the Netherlands, this carefully built machine uses the time-tested lever technique to press hot water through the coffee with a piston, providing you with a perfect cup every time. Features include an open boiler that holds up to 350cc of water, three included filter basket and a double spout for brewing two cups at a time, and a handsome wooden wall-mount frame. 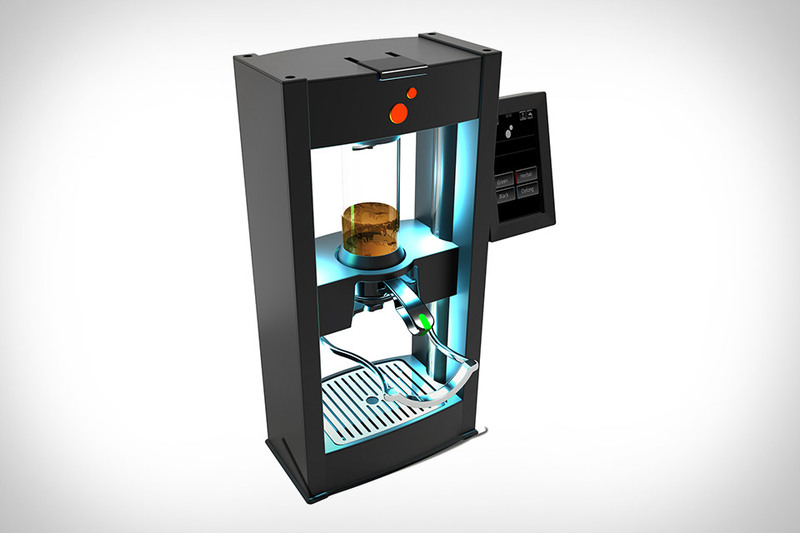 Looking more like a piece of Cylon technology than anything made by human hands, the La Marzocco Mistral Espresso Machine would feel right at home in your geeky office space or quirky coffee shop. In slight of its intimidating appearance and commercial build-quality, this machine is easy to use once it's all set up, letting you brew great espresso and steam milk like a pro. It features automatic setting, a double boiler, an articulating steam wand, high capacity, a hot water dispenser, a cup warmer, and much more. It's so easy you may never head to another Starbucks again.